Lifeguard Press just sent over samples of their new printed paper tape by Jonathan Adler. I love it. 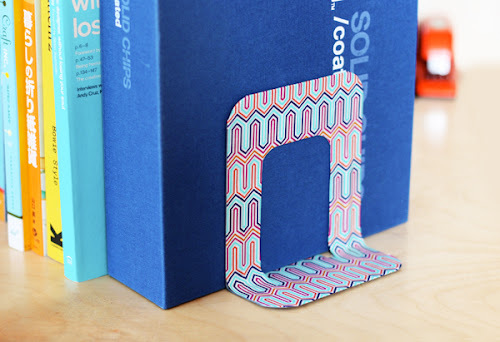 Jonathan Adler is one of my all-time faves— those mod, geometric designs always float my boat. The tapes come in a pack of three inside a dispenser. 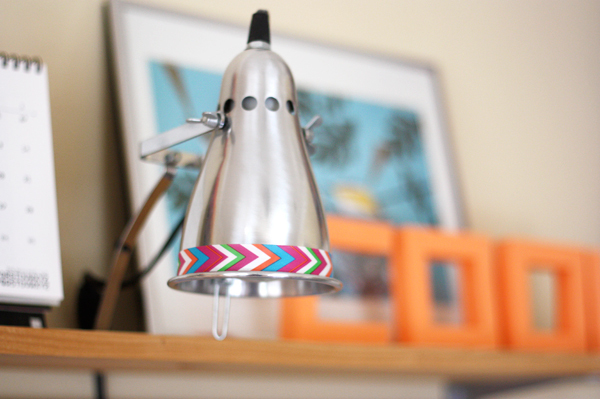 This stuff is not as sticky as washi tape, so it's easy to reposition. 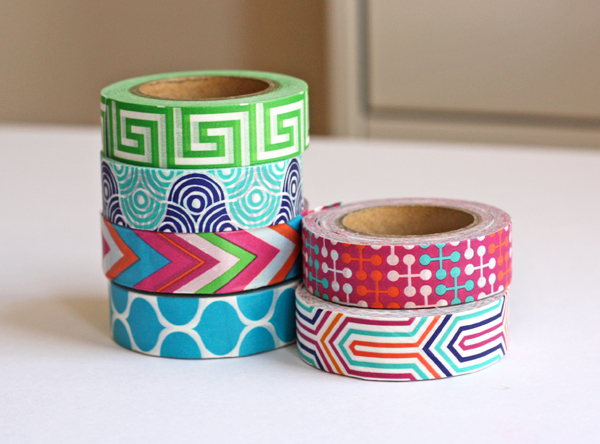 I got a little tape-happy around the office. A boring gray bookend became patterned. Edges on a bookshelf became patterned. A desk lamp became patterned. 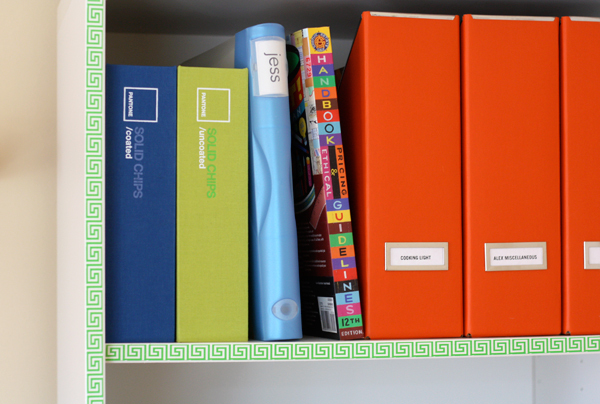 Grab some Jonathan Adler tape right here. I'll post another project tomorrow! Oh, FUN!! They're so pretty! Lucky you! That's fantastic! Thanks for sharing! Eek! Beautiful tapes. I love the tea lights, so pretty! Have you also seen all of the Orla Kiely collaborations? If you like Adler's sixties and mod inspired patterns, you will dig it (or the classic Marimekko). Jonathan Adler rocks my world too. Keren, I love Orla and Marimekko! I'm sure I have not seen all of the various collaborations out there. Just spotted Marimekko Converse shoes the other day. So cool. I immediately went and washied something as soon as I finished reading this. Those Adler tapes are rad! I kind of feel weird about Adler claiming "design" on a Greek Key though. All the other stuff looks fine and dandy to me, but slapping some green on the Greeks and marketing it as an original design is...yeah kinda bunk to me. That said, if it weren't that particular shade of green, I'd prolly buy it. It looks very pretty indeed! Often I'm quite overwhelmed by busy geometric patterns but these are just right! 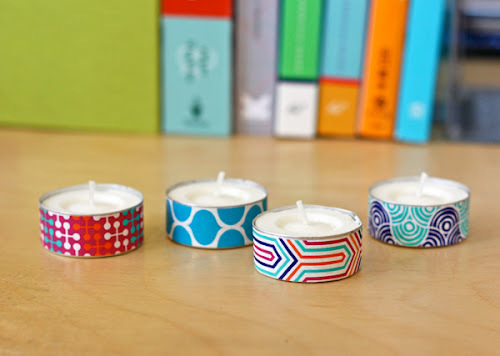 I just love the tape on the tea lights! What a brilliant idea!! I absolutely adore that bookend idea. Did you have a thicker tape, or are you absolutely perfect at lining the tape up exactly? I looked but couldn't find seams anywhere! It's the same tape, 9/16" wide, just placed very carefully. There is a Jonathan Adler store here and I almost cashed out my inheritance to buy a chair. I love that man. I ended up with coasters so I must have the washi tape. And if Orla Kiely ever does washi tape, my head will explode! I can't wait to use this on my new blog, as well as the Lotta Jansdotter washi tape. Oh dear, there's so much to do! Yeah! We need Orla tape! New blog, wha? I'm so flipping excited about this! Love JA's graphic designs and now I will be able to put them everywhere! !